We've all been there. You reach for a bottle of ketchup and with one squirt ruin your hot dog or French fries with watery mess instead of the thick, proper ketchup you were expecting. The water at the top of the bottle sprays or dribbles out unexpectedly, and you're surprised every time. Thankfully, this all-too-common problem has just been solved. Richards and Thompson began with 60 designs and narrowed it down to five before deciding on their mushroom-like cap. Then they turned their design into reality by using a 3D printer. The design is “based on the pythagorean cup idea,” Thompson told KCPT. 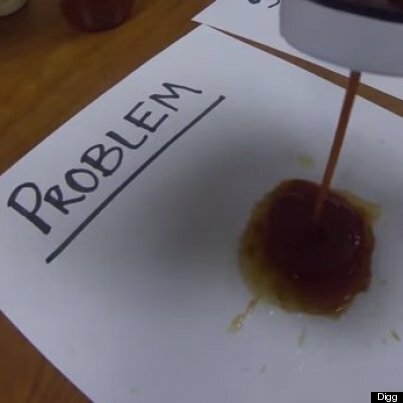 The ketchup can't get past the wide end of the cap, so when you squeeze the bottle, pressure forces the ketchup through the narrow tube, leaving the water to collect in the concave part of the cap. “It’s also the same principle that toilets work off of,” says Thompson. These high school students are genius by our count, and they also happen to be totally endearing. "I've actually been made fun of for my consumption of ketchup," said Thompson. "It's turned his hair red," Richards followed up. While the ketchup device was just part of a school project, we hope Thompson and Richards mass-market the design for the rest of us. Eating hot dogs and French fries may never be the same.